Each crafting station is decorated with appropriate tools for the profession it’s associated with, following our theme of adding visual variety wherever possible. This video also shows off the doors that are now fully working and buildable in-game too. It was fortunate that the first draft was ready this month, as we attended the PC Gamer Weekender in London on 18th to 19th. Well, when I say “we”, this time it was just myself (Ross) – but if you’re attending EGX Rezzed at the end of March we’ll be there with more of the team and a slightly more polished playable build to get your hands on! In fact, by the time Rezzed comes around, we’ll have launched on Kickstarter (March 27th) and we’ll be freely distributing the playable prototype. Even if you might not be planning on backing us on Kickstarter, if you do want to try out the prototype build then please sign up to our Kickstarter one-off mailing list as that’s where you can first find out where to grab the demo. It was fantastic to get some hands-on feedback for the first time from people playing the game and we’ll be doing more and more of this from now on. 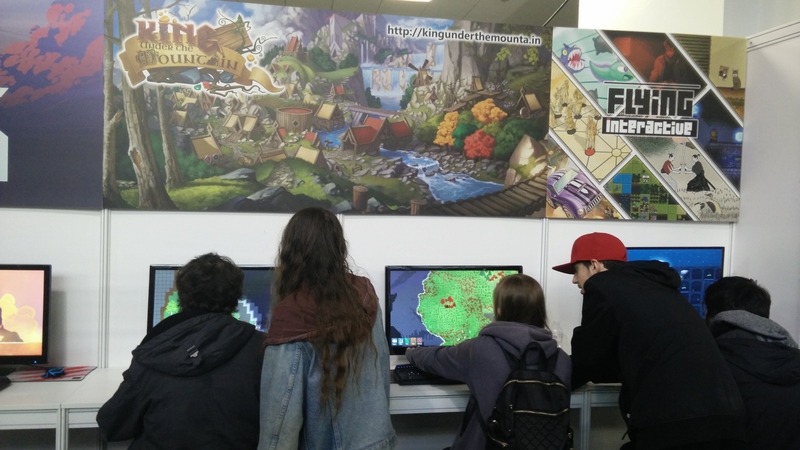 It was a particular pleasure to be able to meet some of you who’ve already been following the progress of the game, as well as meeting people discovering it for the first time! As I mentioned last month, we have M Joshua of http://mjoshua.com producing the first trailer for King under the Mountain. Josh very kindly gave a behind-the-scenes look at the editing process as well as some thoughts on his approach to trailer production and the game in a stream on Twitch. Note that this is a trailer of the early pre-alpha build available currently and is intended to go with our Kickstarter and Greenlight campaigns – I’m sure we’ll have a trailer with many more features in the future as we approach the first proper alpha release! If time allows I’d like to squeeze in a couple more features to the prototype, the biggest probably being building walls though deadlines are getting quite close so we’ll have to see. Either way, this is what we’ve been building up to for the last 6 months or so, and King under the Mountain becoming the game I’d love to make really does hinge on the Kickstarter campaign being a success. Check out the roadmap, and if you like what you see, please consider signing up to our Thunderclap campaign to help spread the word (and you can win a free copy of the game! ), it really does make a big difference. See you on the other side!